In my previous post on Chicken Cacciatore I used the meaty parts of a whole chicken and was left with almost 2.25 lbs. of chicken with a little bit of meat and loads of flavor. So, while the Cacciatore was simmering away, those leftover parts were well on their way to becoming a pot of Chicken Noodle Soup. I’m a huge supporter of the movement to reduce the amount of food we waste in this country and this is an example of how with a little bit of effort you can turn one chicken into two great meals and use up the dribbles and drabs hanging out in your refrigerator and pantry. I have been calling this type of dish “Refrigerator ……” but I think I may start referring to them as Dribbles & Drabs as I just looked it up and Dribs & Drabs is considered an emphatic phrase. I’m pretty emphatic that this is a good practice! 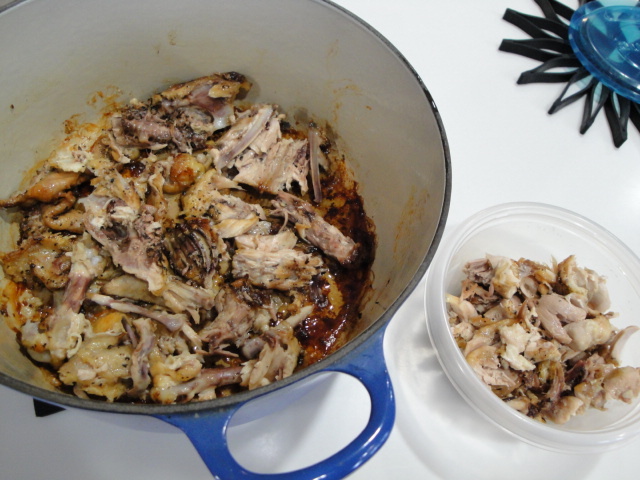 It starts with all those bony chicken parts that you have when using a whole chicken for pieces in a recipe. If you don’t have time to deal with them immediately, just throw them into a plastic bag and toss them in the freezer until you do . 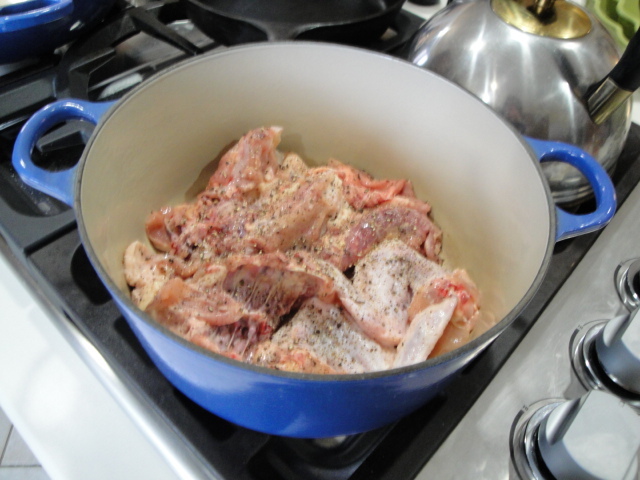 However while the Cacciatore is simmering you should have plenty of time to throw them into a pot or pan. Sprinkle with salt and pepper and put them into a hot oven to roast for approximately an hour. I usually turn them over about half way during the roasting to make sure all surfaces are nicely browned. When they are browned, set them aside until they are cool enough to handle. Pull the meat from the bones. Refrigerate the meat, put the bones back into the pot and cover with cold water. Simmer for 30 minutes or so and then refrigerate for several hours or overnight to allow the fat to rise and solidify on top. If you need to you can separate the bones from the broth and transfer to a smaller container but I’m not fond of washing more dishes than I need to, so I’m going to refrigerate it as is. Once the fat is at least semi-solid, skim it from the surface and put it into a small skillet (don’t worry if you take some broth with it). My Jewish friends would call this schmaltz and even though it goes against the “eat less saturated fat principle”, it delivers great flavor to the soup. As long as you don’t over do it on a daily basis, I’m a believer in using the fat I render from the meats I am cooking. 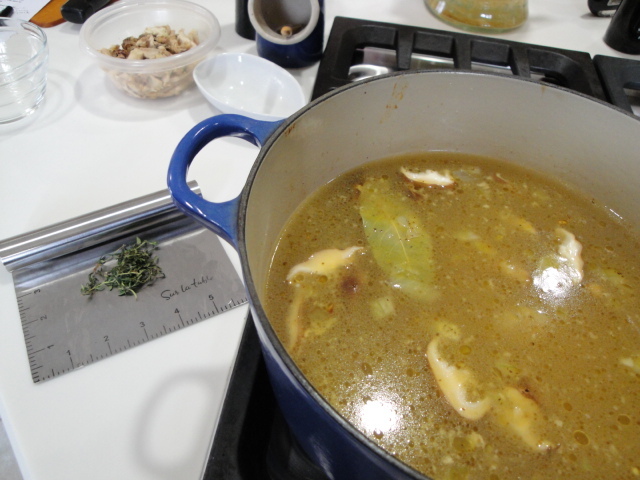 Bring the stock with the bones to a simmer while you work on the rest of the mise en place. For the remaining Dribbles & Drabs in my soup, I’m using some carrots, onion, mushrooms (an addition because I had more than I needed for the cacciatore) , thyme (fresh today but dried is fine), bay leaf, celery seed (all out of fresh celery which I would normally use in chicken noodle soup), the chicken I pulled from the bones, some dried egg noodles (on another day I might make fresh or even throw together some dumplings) and some fresh parsley. Slice and dice the fresh stuff. Heat the chicken fat. Add the fresh stuff along with the dry herbs to the melted fat and cook until the carrots are slightly tender and the onion is translucent. Strain the bones and skin from the simmering stock and discard (at this point you’ve taken as much from this chicken as it has to give). You should have 6 to 8 cups of stock, if not add some water to make at least 6 cups. 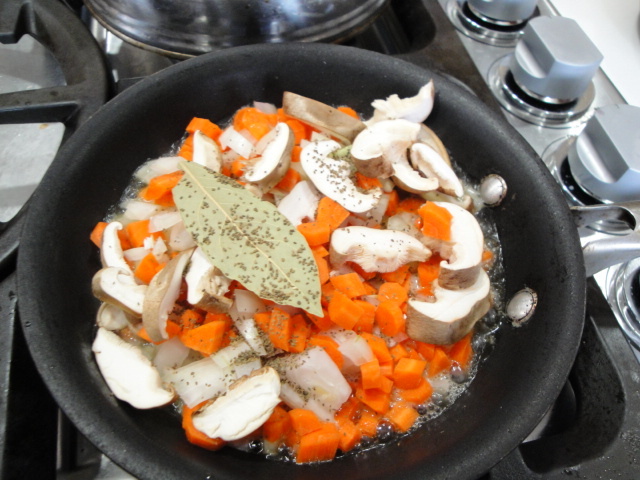 Add the cooked vegetable mixture, the fresh thyme and the chicken to the pot with the stock and bring to a boil. Once the stock comes to a boil add the noodles and cook according to the package directions. In the case of the noodle I’m using today that time is around 15 minutes. 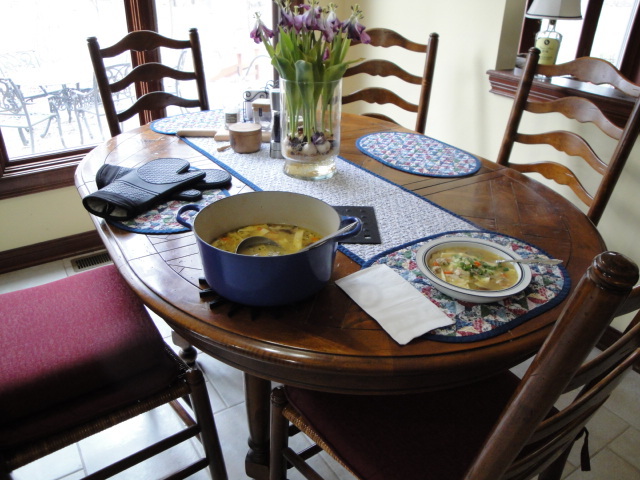 The noodles I’m using are Mrs. Millers Old Fashioned Wide Egg Noodles (Extra Fancy Durum Wheat Flour, Fresh Whole Eggs, Water)-Fredericksberg OH. I think they are quite good for a commercial noodle. Be sure to taste for salt as you add the noodles, mine needed a teaspoon or so at this point. 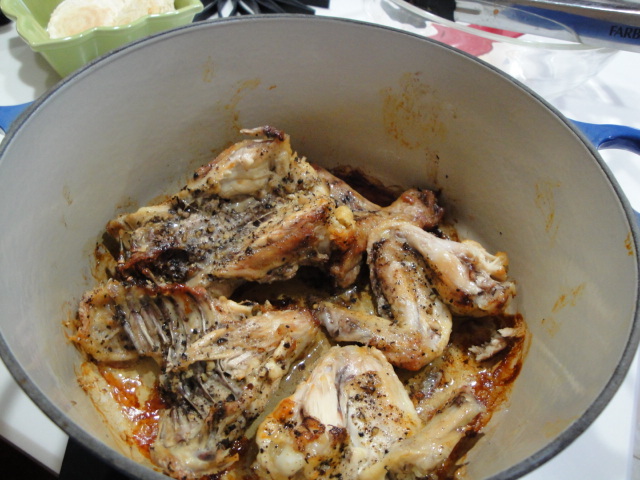 Place bony chicken parts in oven safe dish such as a Dutch oven. Sprinkle with salt and pepper. Roast at 400° F for an hour or so, until chicken is nicely browned on all sides. Remove from oven and let it rest at room temperature until the chicken is cool enough to handle. 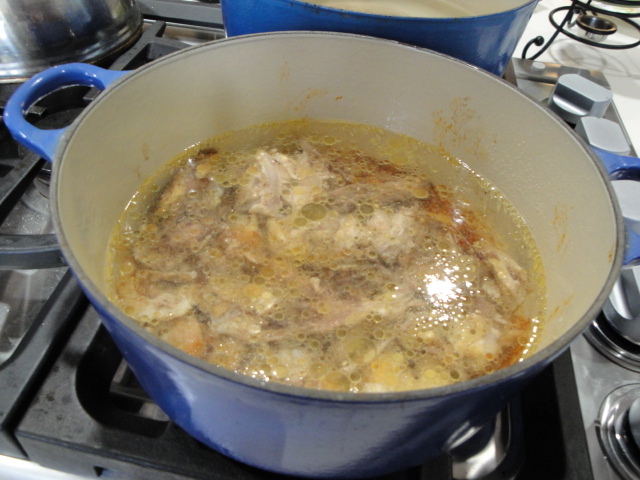 Remove the meat from all of the bones and refrigerate, return the bones and skin to the pot. 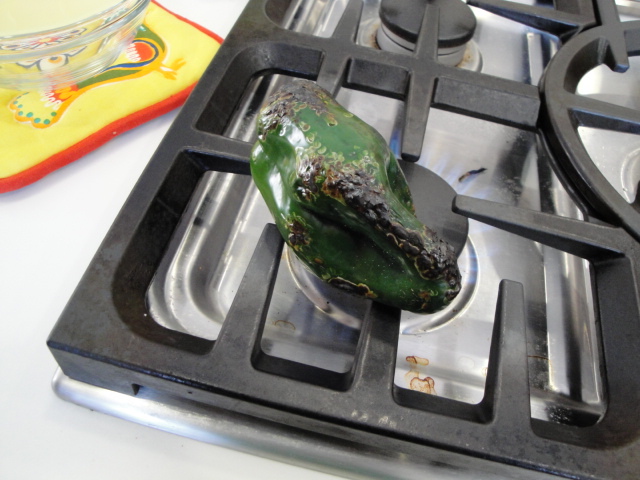 Cover with cold water and simmer for approximately 30 minutes. 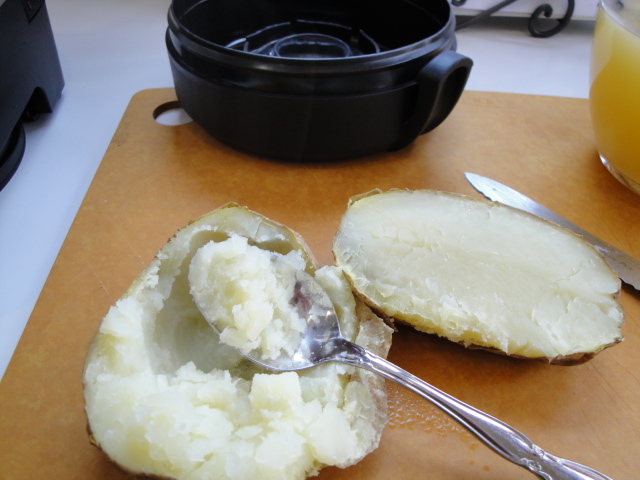 Refrigerate the pot overnight or until the fat has risen to the top of the pot and is solid enough to remove. 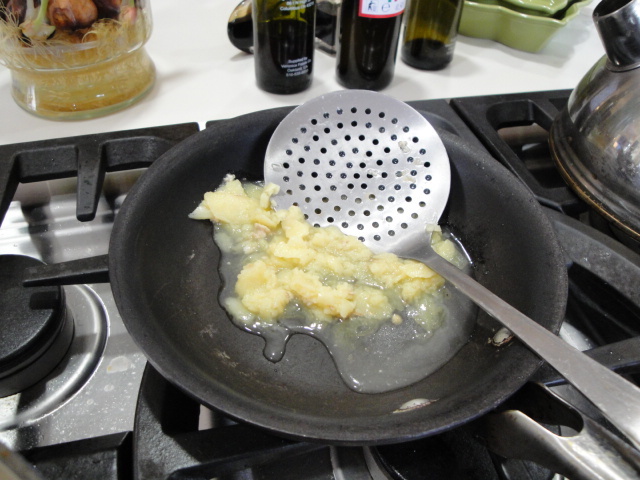 Skim the fat from the surface and place in medium skillet or saucepan. 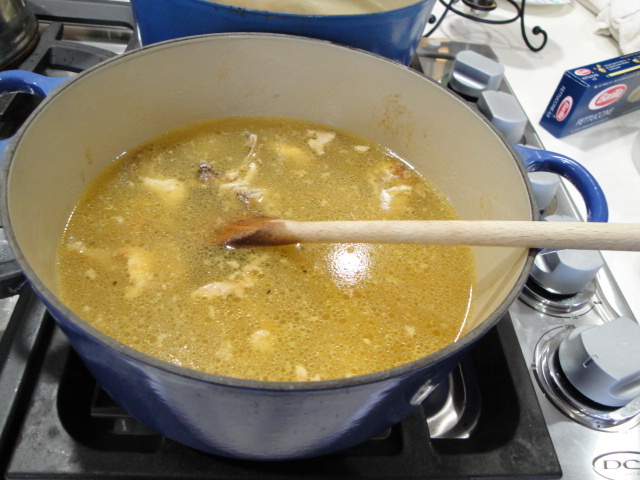 Bring the stock and chicken bones to a simmer. 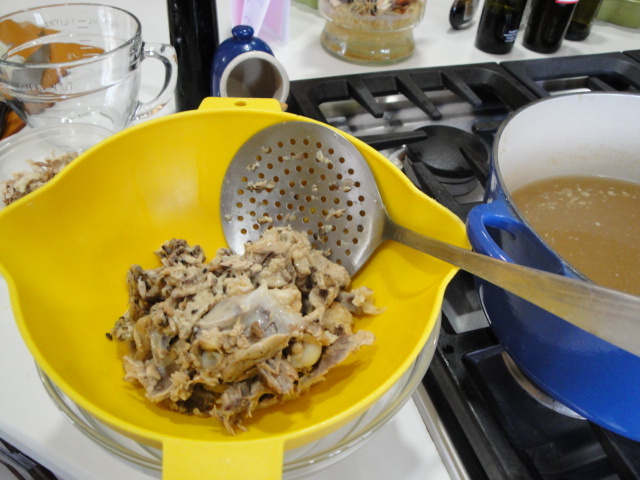 Remove from heat and strain the stock to remove the bones and skin. Add water to the stock if necessary to make 6 to 8 cups of liquid, return to the pot and set aside. 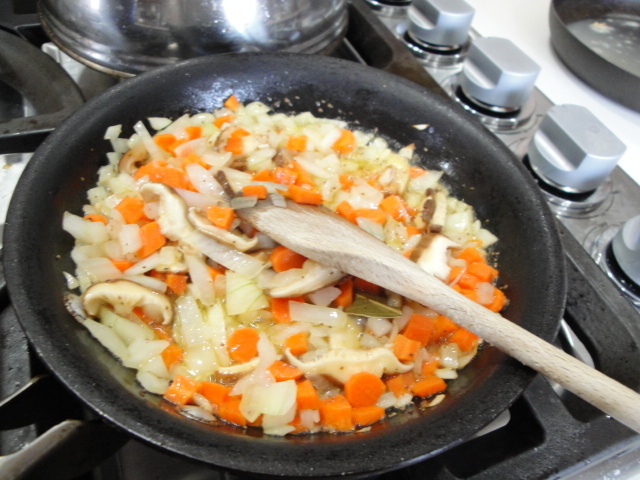 Heat the skimmed fat, add the onion, carrot, celery and bay leaf and sauté until the onion is slightly translucent. Add the mixture to the soup stock along with the thyme. Bring to a boil and add the noodles and reserved chicken meat. Cook at a rolling simmer until the noodles are tender. Depending on the type of noodle, this will take anywhere from 9 to 15 minutes. Season to taste with salt (you will likely need to add salt, so taste when you begin to cook the noodles so they will be seasoned) and pepper. Remove from heat and sprinkle each serving with minced parsley. Sometimes in life you need a personal vacation. This is a time to venture off on your own to follow a passion without having to consider anyone else’s needs or desires. I fondly call it time to contemplate the great undifferentiated aesthetic continuum. Not sure I ever really grasped the deep meaning of this one but love the way it rolls off one’s tongue. For me it was about taking some time away from the responsibilities of work and family to do something I really loved and charge my batteries. I’ve done this a few times over the years, mostly by extending a business trip with a few days of personal time to explore a new country or city on my own. Once however, I took an entire week just for me. My destination was La Villa Bonita Cooking School. At that time the school was located in the lovely and then relatively safe city of Cuernavaca, Mexico. The city which is about a 30 minute drive south of Mexico City, lived up to its name of the City of Eternal Spring with beautiful weather during my entire stay. The school was located in a former convent just down the street from a beautiful cathedral, the Museo Robert Brady and a short walk to the Zócolo. As with nearly all of the homes lining the streets of Cuernavaca, the beauty of the spot was completely unnoticeable from the street, sitting behind high walls and locked doors. Inside however, was an oasis of vegetation and a beautiful courtyard leading into a spacious kitchen perfect for conducting small hands on classes. The school has since outgrown this spot (it had only three guest rooms) and moved to a more spacious and luxurious spot in the Tepoztlán mountains. If there weren’t so many other spots on my bucket list, I’d be headed back there to check it out! This time I wouldn’t need to carry back the binder filled with recipes, tortilla press and molcajete that came as a part of the class (long before the airline 50 lb weight restrictions). This trip came when I was still missing some of the foods I loved in Los Angeles. In particular I was craving the hand-made tamales I bought by the dozen from the parents of one of my colleagues. The other dish I was determined to master an authentic Mole Colorado. These were the two that I left home determined to add to my culinary repertoire. However, as is usually the case when I travel I discovered several dishes that I had never experienced before – Chiles en nogada, Quesadillas with Squash Blossoms and Huitlachoche just to name a few. I always feel a little sad when I hear someone declare “I don’t like Mexican food”. I’m also fairly certain that their exposure to this fabulous cuisine doesn’t go much beyond Taco Bell. From simple street tacos to complex moles I love it all. 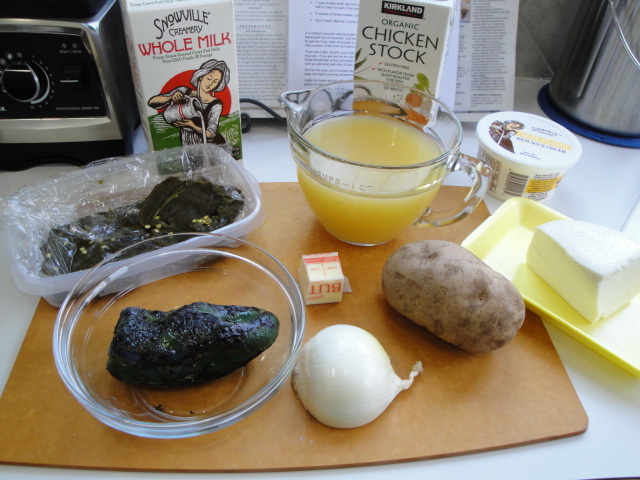 Of all of the dishes that I experienced on this culinary adventure, the one that has definitely become a favorite at my table and has been shared with many others over the years is a simple Poblano Soup. Before this trip, poblano’s weren’t yet on my radar and hadn’t gained the popularity that they have so rightfully claimed since. Today we can find them year round in most supermarkets and buy plants or seeds for our gardens at most nurseries. They are an easy to grow and prolific plant, so having several recipes in which to enjoy the fruits of my garden is a must for me. The other great thing about them, is they can be roasted and frozen for use in soups such as this one, all winter long. Roasting the Peppers-over an open flame until blackened and blistered over the entire surface. If you’re making a dish that requires only a few peppers this is my go to method. It’s also the way I first learned to do it during my stay in Cuernavaca. If you are not lucky enough to be cooking with gas, you can achieve much the same result by roasting them on a sheet pan under the broiler unit of your oven. I suggest cutting them in half to speed up the process and limit the number of times you have to go into the oven to turn them. In the summer when I’m working from my garden I use my gas grill (just wait a few months and you’ll see)!! 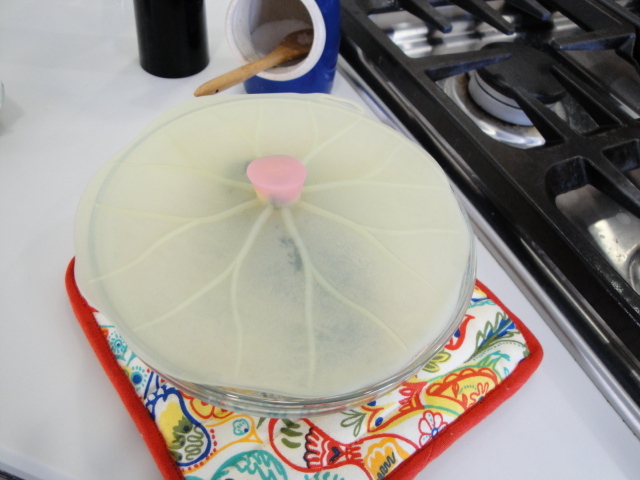 I’m a big fan of these silicone covers but plastic wrap works as well. 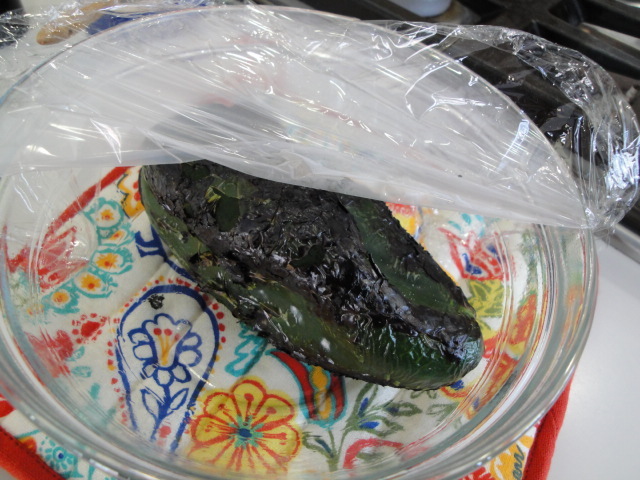 Simply place the charred peppers in a bowl and cover. It will take only a few minutes for the steam to loosen the skin from the peppers, but you will be peeling it by hand, so wait until you can handle the pepper comfortably. If you have sensitive hands you may want to wear gloves, but most poblanos are on the lower end of the heat scale so you may be able to handle them bare handed. In any case the most important thing to remember is Do no rinse them under running water. I know that you will want to do it, because it just seems to be the natural thing to do, but you’ve worked hard to get those lovely roasted, charred flavors and you don’t want to rinse them away. 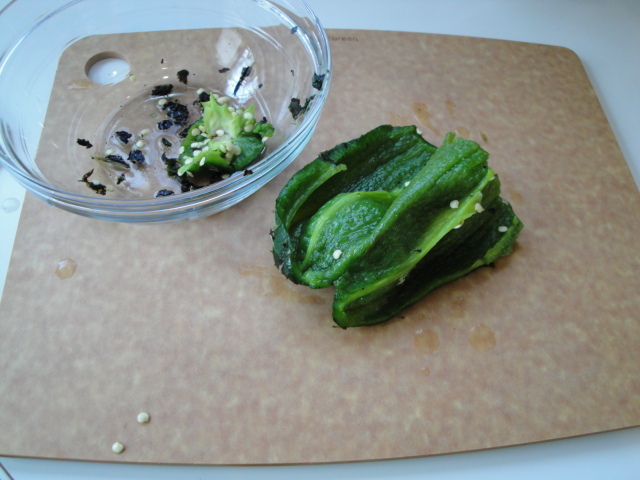 Simply peel off the loosened skin with your fingers or a small paring knife. Remove the stem and cut the pepper open and remove the seeds and veins (those tough white parts running down the length of the pepper). Now you’re ready to concentrate on making the soup! So I have one freshly roasted pepper in the front and the last remaining peppers from my freezer stock are just behind. 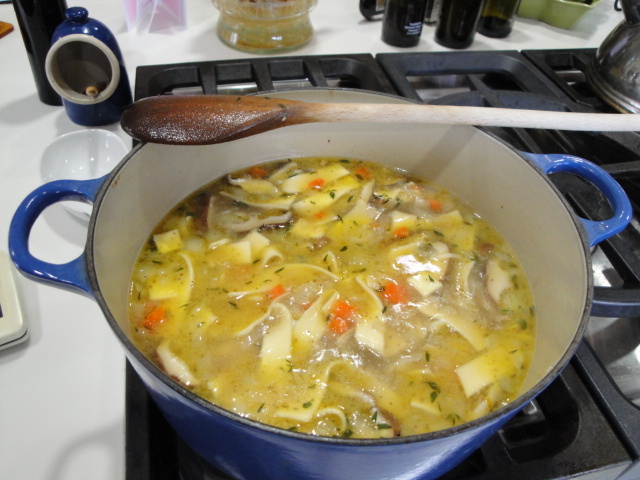 I use them all winter long in dishes like this soup where I want the flavor but don’t need great texture. The only other things you need are onion, potato, butter, stock, milk/cream, a soft, creamy cheese and perhaps some sour cream/crema/crème fraiche. Start with diced onion in melted butter on medium heat. You just want to soften the onion until it is translucent but not browned. In the original version of the recipe it suggests straining out the onion and just using the onion flavored butter, but that’s definitely not my style! Peppers, cooked onion and potato all go into a blender or food processor. This is one puréed soup where I actually prefer using one of these devices over my immersion/stick blender. 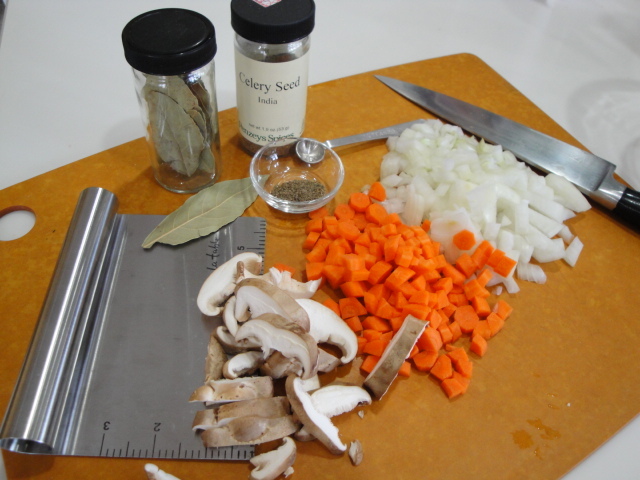 I like this soup to be perfectly smooth and silky and since I’m not working with a hot liquid or dirtying an extra pot, it’s the way to go for me. Puree these ingredients until perfectly smooth. 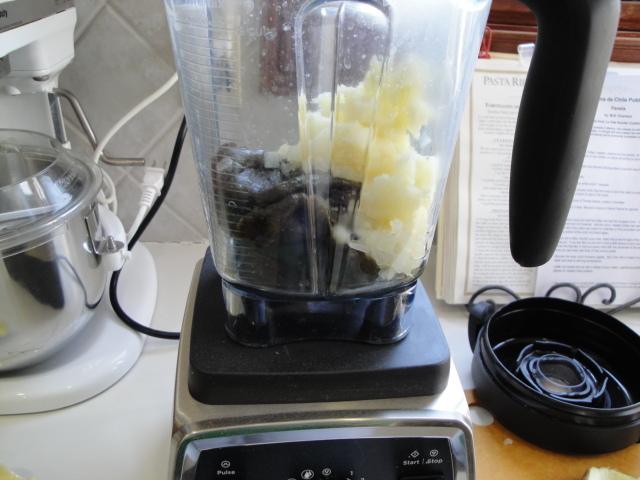 You may need to stop the blender and scrape down the sides a few times and you can add a bit of the room temperature stock after a bit of blending. 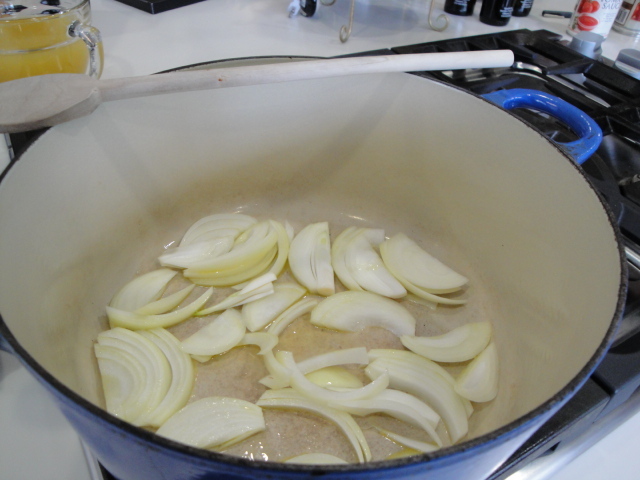 Pour the puree into the pot where you sautéed the onion. Rinse the blender with the remaining broth. I start with a total of 4 cups of broth and then taste to see how much more I will use. 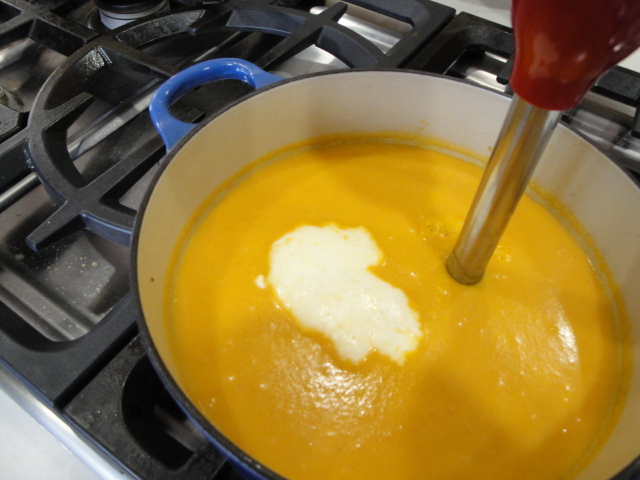 If the soup seems really spicy to you, you will want to use whole milk and/ or heavy cream for the rest liquid. In this batch I ended up using 1 cup of cream and 2 cups of whole milk. It’s really up to you and how spicy vs. creamy you want it to be. If you’re using all fresh peppers, the soup will be a brighter and more vibrant green. The freezing process takes a bit of a toll on the color, but in mid March when my garden is still months away from producing, I’m happy to have a bowl of homemade soup made from frozen peppers! 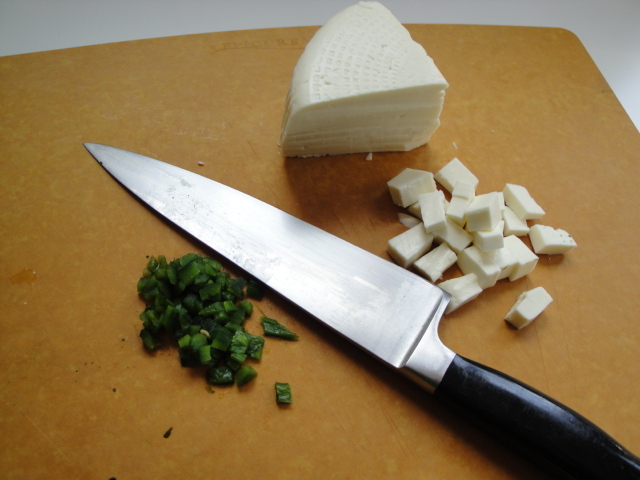 Now all you need is some cheese and for those who like it spicy some of that pepper you saved for garnish. The cheese of choice is Mexican Panela. I found it in my local Mexican Market-La Michoacana for $4.99/lb. If you can’t find Panela, most stores carry Queso Blanco-generic for white cheese. The beauty of Panela is that it gets soft in the hot soup but does not melt or string as a mozzarella or Jack cheese would. Queso Blanco has a very similar flavor and is just a tad more crumbly in texture, so if you can’t find panela it makes a great substitute. Today this soup is so delicious and creamy it doesn’t even need the addition of the crème fraiche I had planned to top it with. This, I attribute to the goodness of the Snowville Creamery whole milk and whipping cream I use. 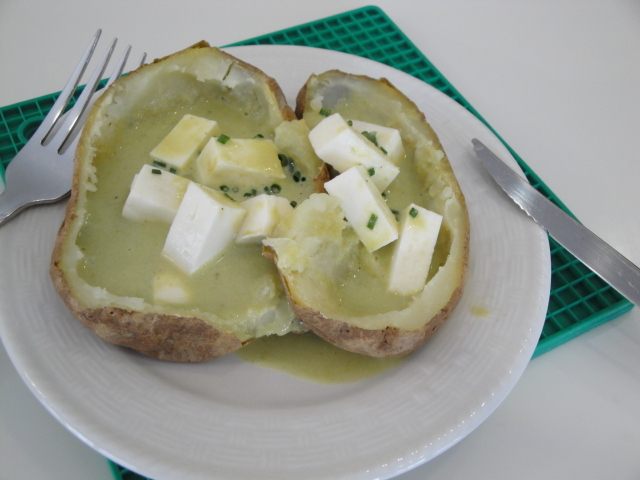 But what this blogger really enjoyed for lunch was that leftover potato skin, topped with some soup, that lovely panela cheese and of course a cerveza! One of the most popular fresh cheeses in Mexico, this cheese is mild, white and crumbly. Like Queso Blanco, it will not run when heated—it will get soft and creamy but will not lose its shape. The cheese is used in Mexico for many cooked dishes and is commonly crumbled over salads, tacos, chili and burritos. 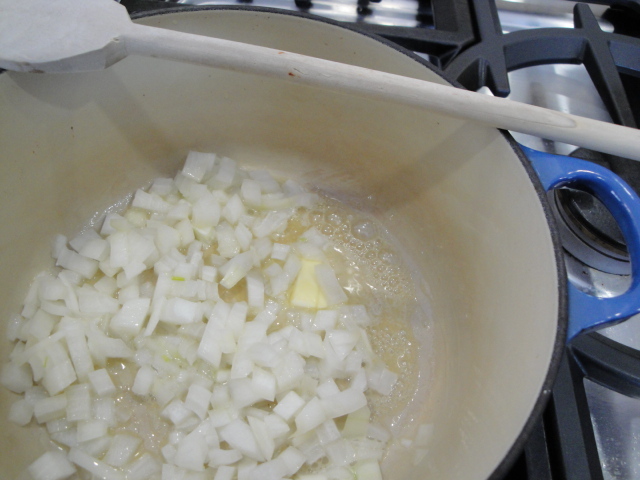 In a medium soup pot melt the butter and add the chopped onion. Cook until the onion is soft and translucent, but not browned. Add the onion, roasted chilies (set aside a small portion of the chilies for garnish if you wish) and potato to a blender or food processor and puree until very smooth. Add a small portion of the broth and blend again. 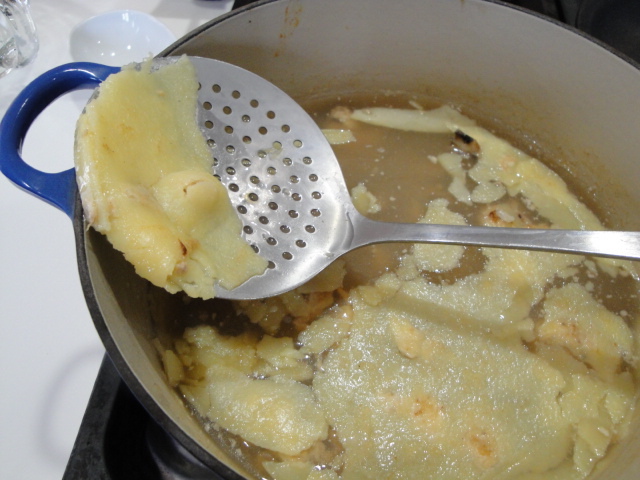 If you are a silky, smooth soup lover, strain the puree through a fine mesh strainer back into the soup pot. If you are like me and don’t mind a little texture to your soup, skip the straining part. Rinse the blender or food processor bowl with the remainder of the broth you are using to make sure you get every last drop of that yummy puree. Simmer the soup until it thickens slightly. Stir in the milk or cream if you are using it, add salt to taste and heat to serving temperature. Ladle into bowls and top with a dollop of sour cream, a generous portion of cheese and a few pieces of roasted chile poblano. * Yes, any onion will do but the white variety is the onion of choice in classic Mexican cooking. They have a clean, sharp flavor, have less of a sulfurous bite than yellow onions and are tender and thin-skinned. I promise not all of my Favorites are soup but hey it is still February in Ohio and the snow is still blowing! 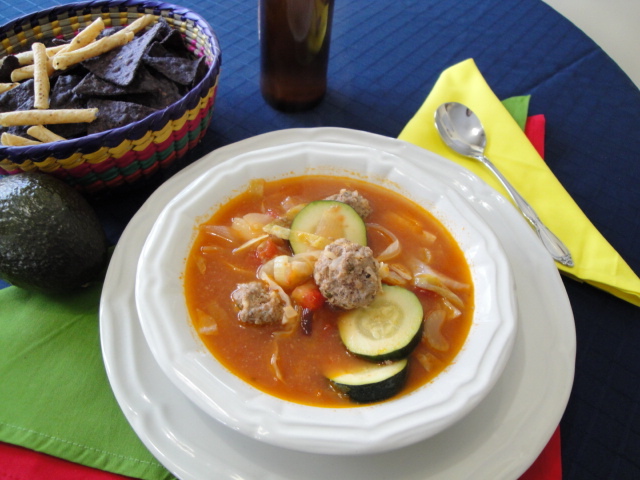 This soup hasn’t been on my table nearly as many times as the Albondigas but it does evoke a favorite memory and is mighty tasty on a cold winters day. In in fall of 2000 I had the great fortune to be able to take my daughter with me on a business trip to Europe. 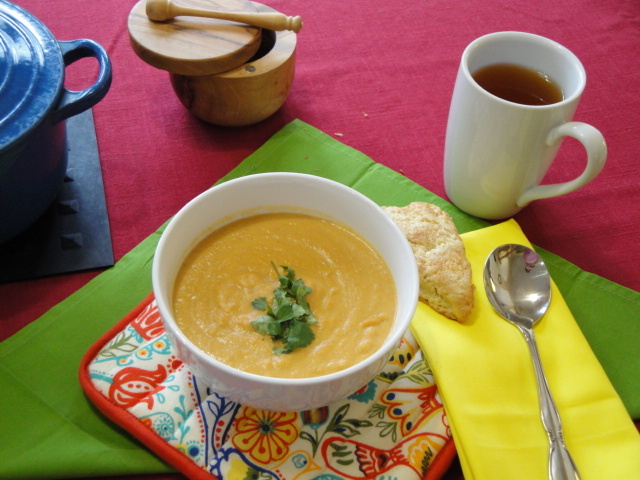 We had many great meals in Paris , Beauvais, London and Bath but the most memorable of all was a bowl of Carrot & Coriander soup in the city of York. It was a blustery November day and after taking a brief walk about the city following the train ride from London we happened upon a small tea shop serving soup and Belgian Waffles topped with whipped cream. It was near closing time and there was only one bowl of soup to share among three very cold and hungry travelers. Perhaps this is why each spoonful was so delectable but I truly believe that this was one of the most well-balanced and flavorful soups I’ve had the pleasure to taste over the years. The sweetness of the carrots was balanced by the warm and citrusy flavor of the coriander. So simple but so satisfying. Upon returning home I searched the web for a recipe to no avail. I guess back then there were not so many postings from the UK sharing their best dishes. So, as with the Albondigas soup I worked to recreate the soup from memory. I never felt I was as successful at hitting a match to that soup from York, but it’s really hard to compete with a memory of something eaten in such a memorable setting with people you love. I do think, however, that I’ve finally gotten to a pretty solid Carrot & Coriander soup that I’m happy to give a Very Good rating to. The key to a simple soup like this one is to source the best possible ingredients. Carrots that actually have carrot flavor (not those “baby” carrots whittled down by machine from giants and shipped across the country). If you have access to a farmers market or belong to a CSA, the carrots they have will be excellent. One of my favorites is Honeystick Carrot grown by Wayward Seed Farms. Unfortunately at this point of winter I’ve eaten all of them and have to use the next best quality available at my local market. The next key ingredient is the broth or stock. I’d love to say I always make my own, but it’s not practical even for a retiree like me and certainly wasn’t true when my children were young. So choose one you like in can or paste form and save the homemade stuff for a time when you really need it to sing as the main flavor note. In this recipe it’s all about the carrots and the coriander which is why I use part stock and part water. Too much stock and it becomes more like chicken soup with carrots. The spice coriander of course plays a star role and in this soup. I like it best with just the lone spice, but coriander pairs well with ginger and with cumin. So here is your place to add your touch. My go to source for all herbs and spices for many, many years has been Penzeys. If you don’t have one in your city I’d really suggest you go on-line and order your spices or find a good spice store near you (if you’re in Columbus Ohio check out North Market Spices). The one ingredient you will not find in my soup that appears in many recipes that are now on-line is fresh coriander (cilantro). I dearly love cilantro, but for me its sharp flavor doesn’t marry well with the warm citrusy flavor of the dried seeds from this plant. But as always, it’s your soup so if you like, add some minced cilantro as a garnish at the end – lots of other people do. If you’re in the middle of fresh carrot season and have access to the carrot tops, they would make a lovely garnish without detracting from the flavor of the soup. 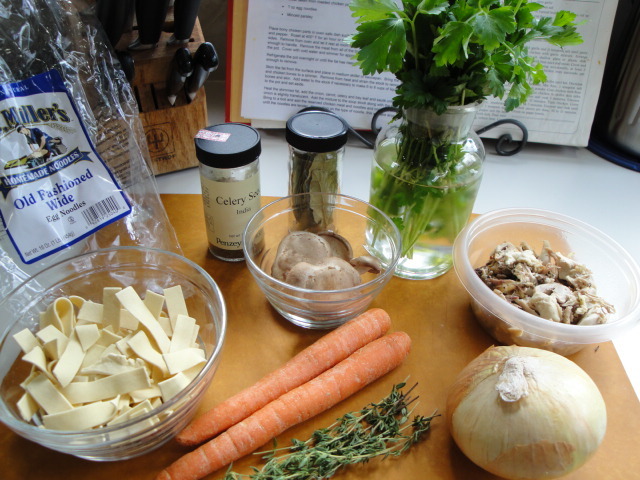 In the middle of winter, I opt for a bit of flat leaf parsley if I have it on hand. Last but certainly not least is the cream. My original version was with sour cream, The second contained no sour cream or cream at all, the only dairy was just a bit of butter to saute the carrots and onions. Then came along Snowville Creamery and the best tasting dairy products you’ve ever consumed. So if you have access to Snowville products or a local dairy producing good milk and cream, a splash of cream or crème fraîche at the end will take the soup to the next level. 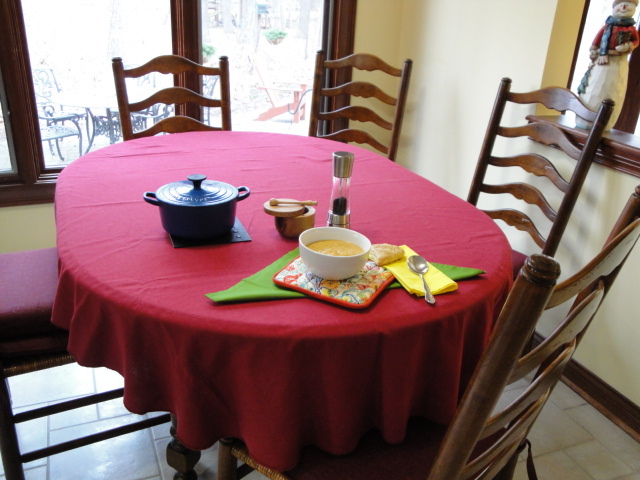 For guidance in the creation of the original soup I relied on Julia Child’s The Way To Cook recipe for Cream of Carrot Soup: Potage Crécy. It seems that Crécy France is known for its carrots. So perhaps I should rename my current soup Wayward Carrot Soup! 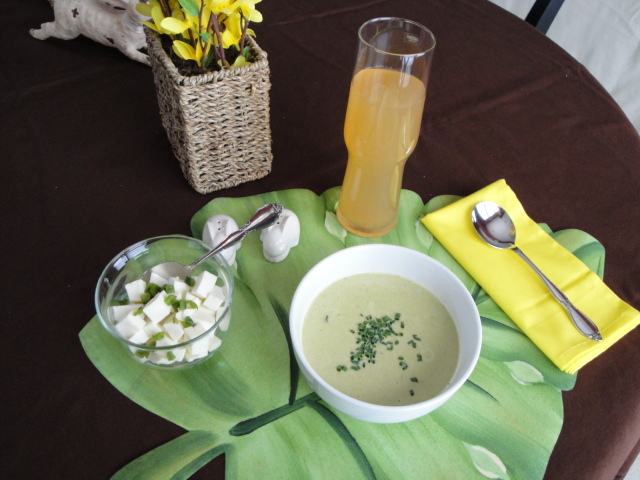 In any case her soup is based on a method of cooking a vegetable with onions until tender and then simmering them in broth along with some white rice until tender and then puréeing the soup with an optional finish of heavy cream, sour cream or crème fraîche. 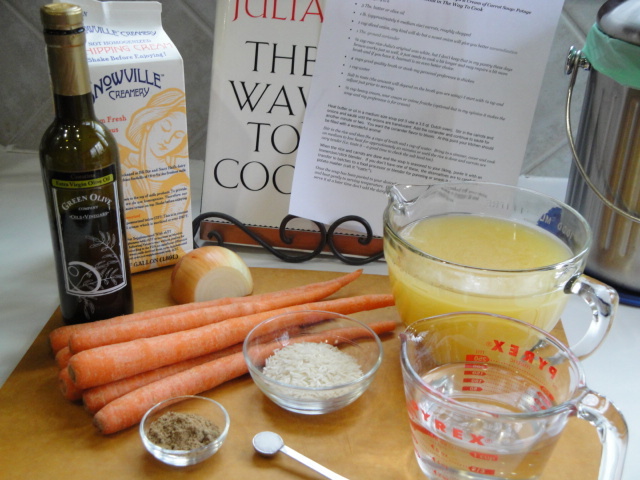 The Way To Cook was published in 1989, when even Julia was looking at ways of cutting back on fat (using rice to give the body that would formally been provided by copious amounts of butter and cream) and letting the pure flavor of vegetables shine. Her method of using master recipes takes a bit of getting used to, but once you do, this book may become your go to reference for building great meals as well as for great late night reading. Once the carrots are translucent stir in the coriander and let the flavor bloom for a minute or two. Add the rice, salt, broth and water, cover and simmer for 20 minutes or so until the rice is done and the carrots are tender. 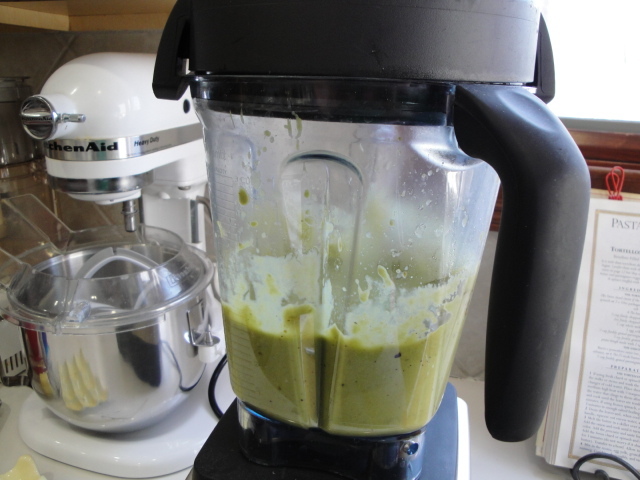 Now you get to use one of my favorite kitchen tools-the immersion or stick blender. 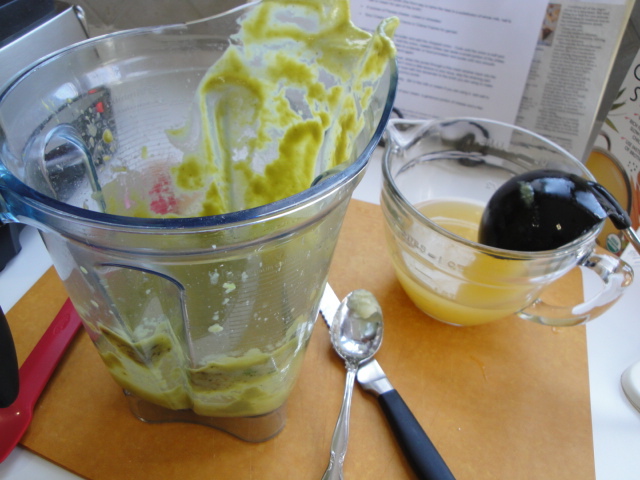 It enables you to make a relatively smooth puree without the hazards of transferring hot soup to a blender or food processor and creating more things to wash. If you want a perfectly smooth soup you will need to use one of the aforementioned tools and perhaps a fine mesh strainer as well. I’m not opposed to one or two pieces of carrot or onion in my bowl, so I nearly always go the immersion route. If you are just building your set of kitchen tools and don’t have a power tool, you can always make a “rustic” soup and simply smash everything with a potato masher. After the soup is processed to your desired consistency, give it a taste for salt and pepper and if you’re serving it immediately stir in the cream etc. This is optional however as the soup is quite tasty without any dairy at all. 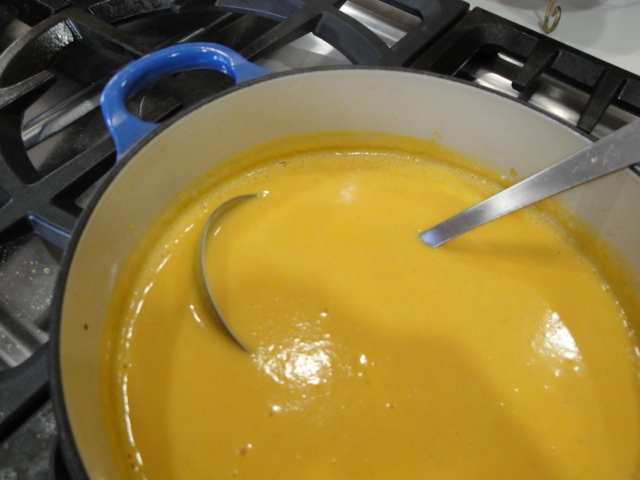 If you’re planning to chill the soup and serve it later, wait until heating for serving to stir in the dairy. The perfect accompaniment for this soup is a scone-so guess what will be coming in my next post!!! 1 lb. (6 to 7 medium size) carrots, roughly chopped-my rule of thumb is peel them only if they are not organic. ¼ cup raw rice-Julia’s original was white, but I don’t keep that in my pantry these days brown works just as well, it just needs to cook a bit longer and may require a bit more broth. Basmati or Jasmine rices are also excellent choices. 4 cups good quality broth or stock-my personal preference is chicken, but a mild flavored vegetable stock works as well. 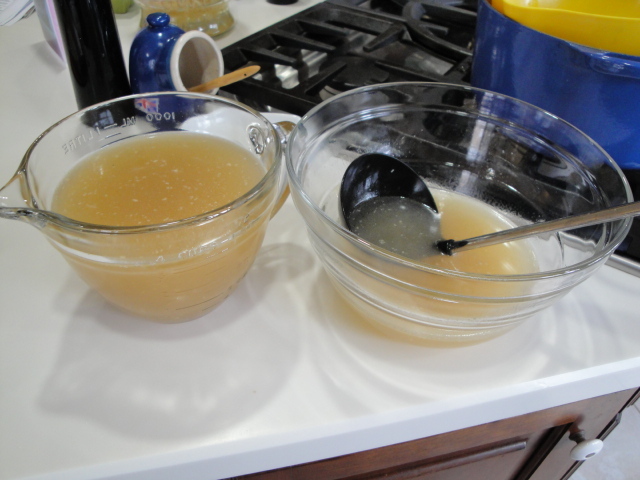 Salt to taste (the amount will depend on the broth you are using)-I start with ¼ tsp and adjust just prior to serving. 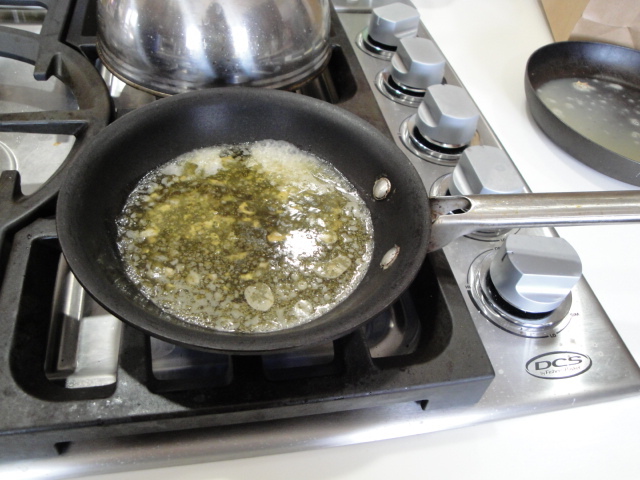 Heat butter or oil in a medium size soup pot (I use a 3.5 qt. Dutch oven). 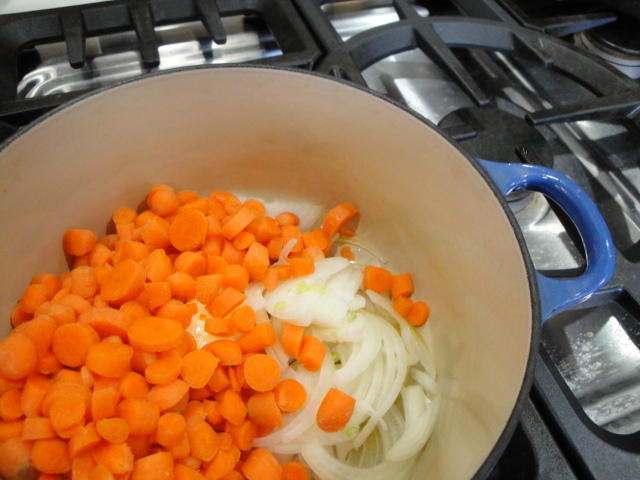 Stir in the carrots and onions and sauté until the onions are translucent. Add the coriander and continue to sauté for another minute or two. You want the coriander flavor to bloom. At this point your kitchen should be filled with a wonderful aroma! Stir in the rice followed by broth, water and salt. 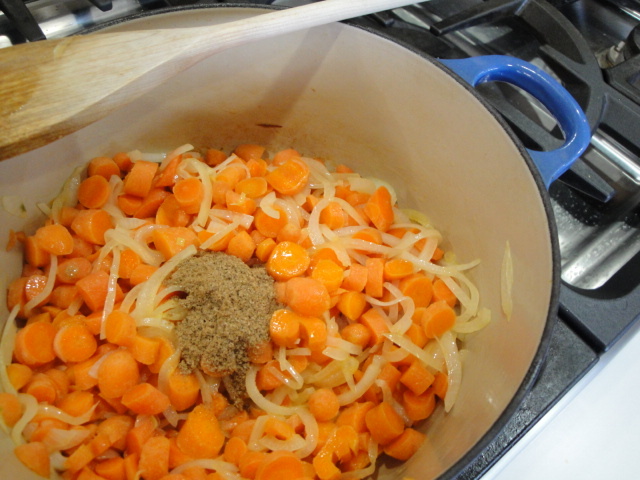 Bring the soup to a simmer, cover and cook on medium to low heat for 20 to 30 minutes or until the rice is done and carrots are very tender (i.e. taste it – a good time to check the salt level too). 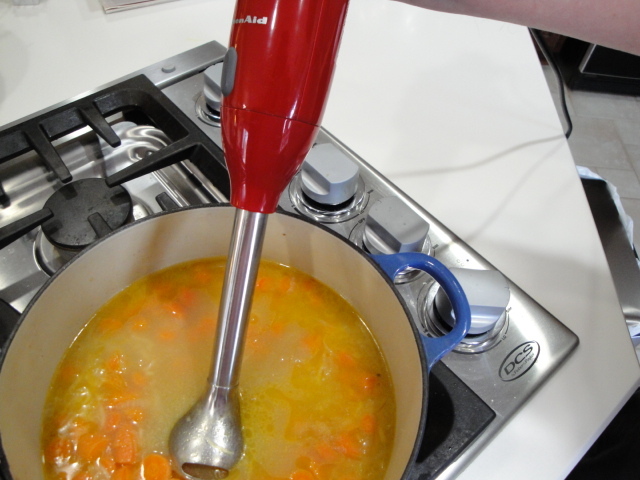 When the rice and carrots are done and the soup is seasoned to your liking, purée it with an immersion/stick blender. 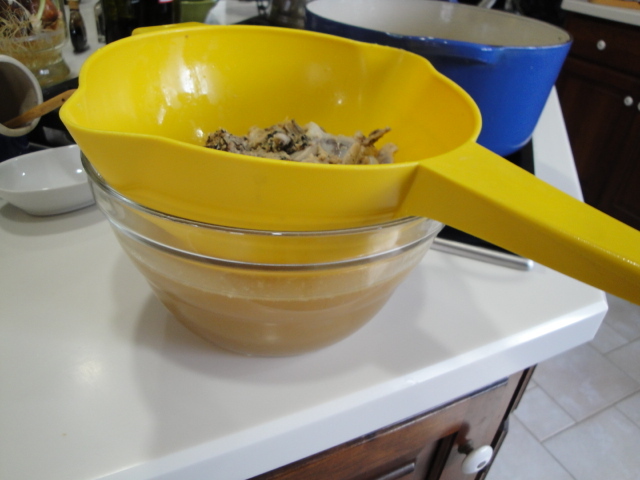 If you don’t have one of these, the alternatives are to carefully transfer in batches to a food processor or blender for pureeing or smash it really well with a potato masher (call it “rustic”). 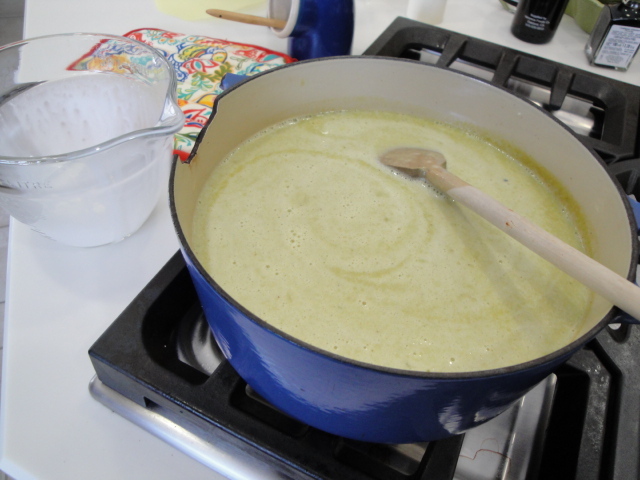 Once the soup has been puréed to the consistency you like, stir in the cream and heat gently to serving temperature. If you are planning to chill the soup or freeze it and serve it at a later time don’t add the dairy until you are ready to heat and serve. 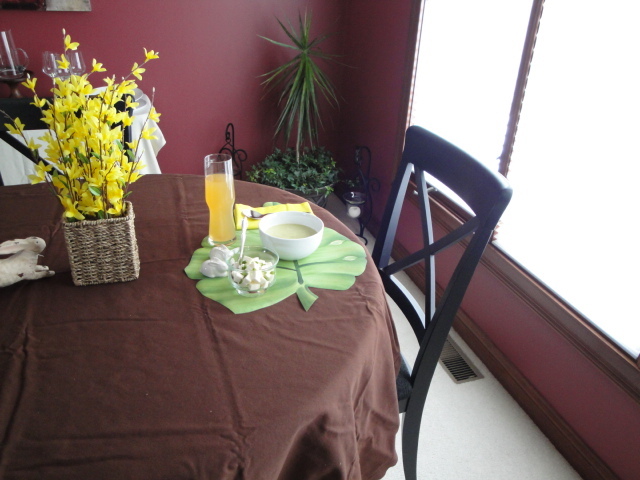 Welcome to the first post of MB’s Table. I hope you enjoy my journey as I sift through my recipe files and cookbooks and pull out my favorites recipes to recreate and share. These recipes will include some of the best meals I’ve cooked with family and friends over the years. As I explained in “About” they are for the most part not my own unique creations. The unique recipes have generally never been recorded, as I’m cooking them on the fly with whatever I happen to have on hand, borrowing from the classic techniques I’ve learned over the years from many other great chefs and cooks. Maybe someday I’ll start recording them as I go!! This first recipe however is one that I do consider my own and I’ve spent many years perfecting it. As with many of the great recipes in life it came about as the necessity of invention. In the 80’s and 90’s I had the good fortune of living in Southern California where Mexican food was wonderful and inexpensive-i.e. no need to cook your own. On nearly every Friday our family and friends would get take out from Alamo Rotisserie in Granary Square. 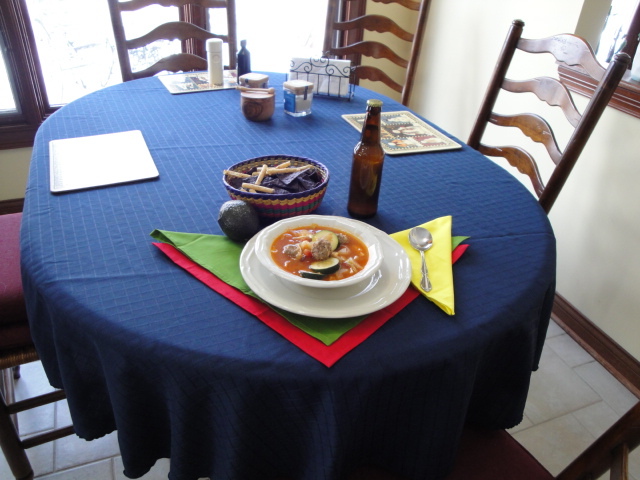 One of the of the staples we ordered at the request of my son was the Albondigas Soup. Loaded with lots of flavor and vegetables it was a working mom’s dream. When we moved to Columbus Ohio in 1994 – no Alamo and no soup to be found!! So I set about creating a soup from my flavor memory with the ingredients I could find at hand. Today I’m giving you the scaled down version of the soup that I’ve been making a minimum of two or three times a year for the last 20 odd years. At one point I purchased a 16 qt stock pot to hold the quantity required to feed the many people at my table for at least two meals. 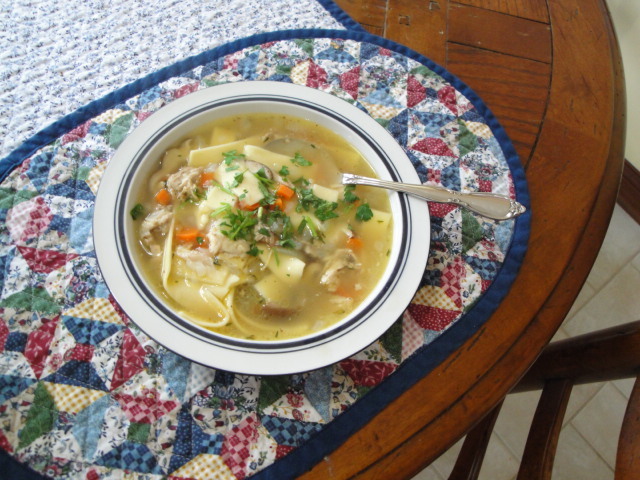 The scaled down version will still make 6 to 8 servings, but trust me, as with most soups of this style it just gets better on the 2nd or 3rd day, so don’t worry that it’s still a lot of soup. 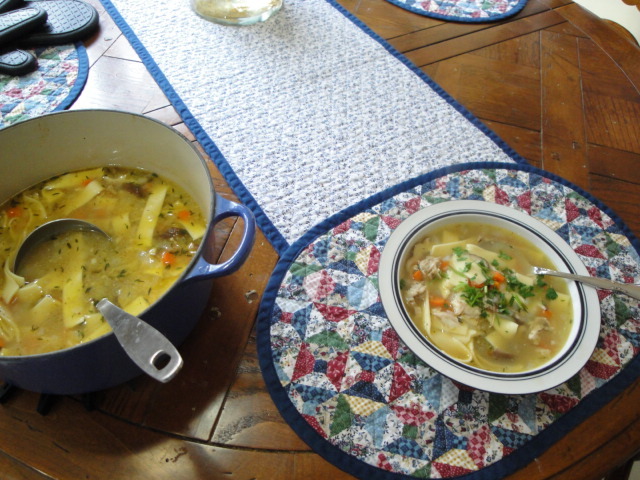 Here’s hoping you enjoy this heart warming soup on a cold and blustery day. Oil, onion, garlic, chile de arbol, broth, celery, tomato sauce, diced tomatoes in juice, potato, carrots, green cabbage and zucchini. Start with the slivered onion in oil and sweat until it starts to become translucent. Then add the garlic and chilies. This is important to insure that the garlic and chile don’t become burt and bitter. In this batch I used just one chile and Kyle noticed that it was a bit lower in heat!! So adjust to your level of comfort. As soon as you can smell the garlic add the broth, celery, tomato sauce and diced tomatoes and bring it to a simmer. Once the soup comes to a simmer, add the potatoes, carrots and meatballs. Be sure to add the meatballs one at a time to keep the temperature of the soup at a simmer. A wide 7 1/4 quart dutch oven like this one is ideal! Once all of the meatballs are in, bring the soup to a low boil, cover, reduce the heat to a simmer and cook for 30 to 45 minutes. 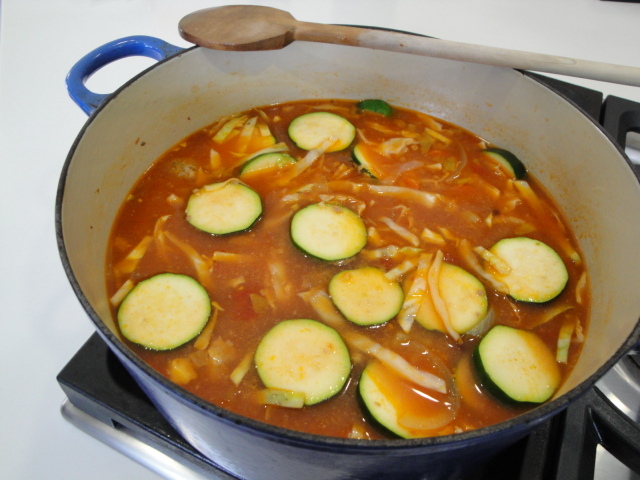 Remove the lid, add the cabbage and squash (in a double batch I like to use one zucchini and one yellow squash) and simmer uncovered for an additional 10 minutes or until the squash is just tender. 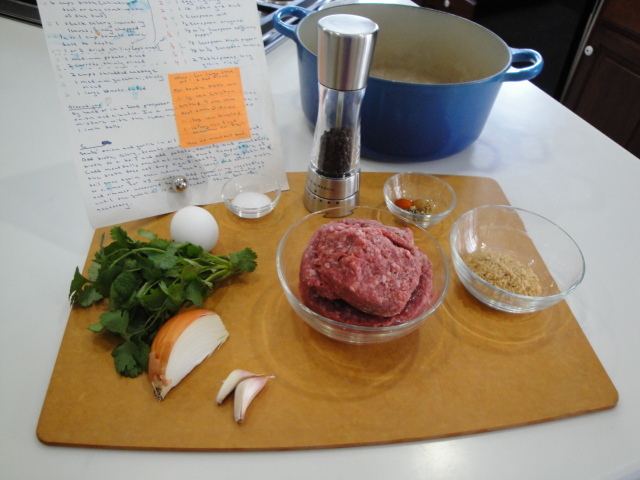 Meatballs: By hand or in a food processor, finely mince the onion, garlic and cilantro leaves. 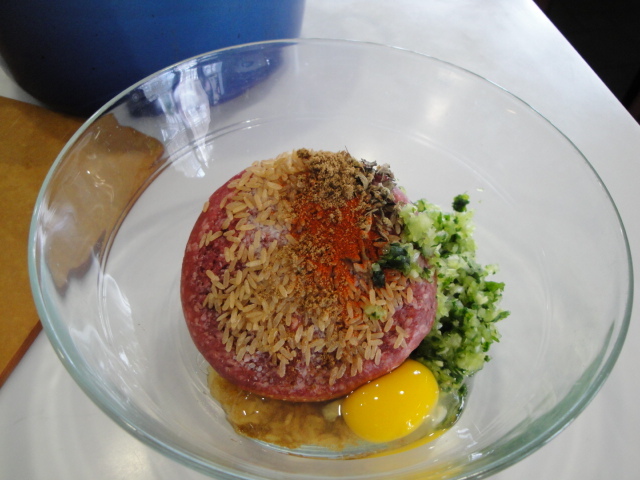 Add the finely minced onion mixture to a medium bowl with the remaining meatball ingredients and combine (your hands will be the best tool here). Form into 1 inch meatballs and set aside until needed in the soup. To be honest I actually wait until I’m ready to add them to the soup to form them as it helps keep the soup at the best temperature if I’m forming them just as I am dropping them into the soup. 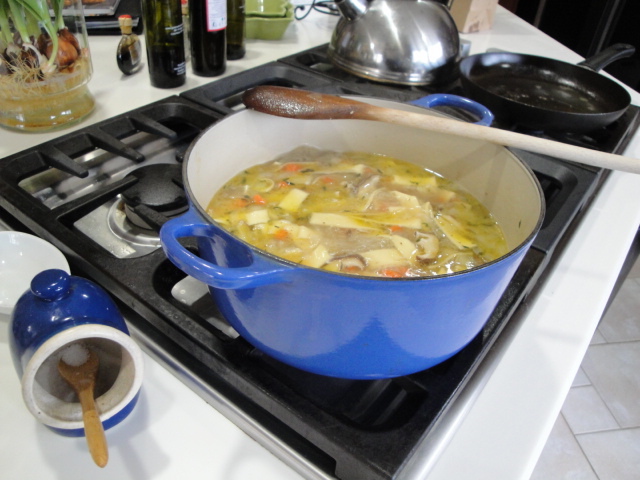 Soup: Add the oil to a large stock pot or Dutch Oven (a 7 ¼ quart is a great size) and heat gently. Add the onion slivers and let them sauté until they are just starting to become translucent. Add garlic and dried chilies and sauté for less than a minute-when you can smell the garlic it’s enough. Add the broth, celery, tomato sauce and diced tomatoes. Bring the mixture to simmer and add the potatoes, carrots and then add the meatballs one at a time so the temperature of the broth doesn’t drop significantly. Once all of the meatballs are in, bring the broth to a low boil, cover and reduce to a simmer. Allow the soup to simmer covered for 45 minutes. Remove the lid and add the cabbage and squash and simmer uncovered for an additional 10 minutes or until the squash is crisp tender.